Pizza is a favorite food for many of us. But what if you're on a diet or trying to improve your eating habits? Is pizza healthy? And how many calories are in a slice of pizza? 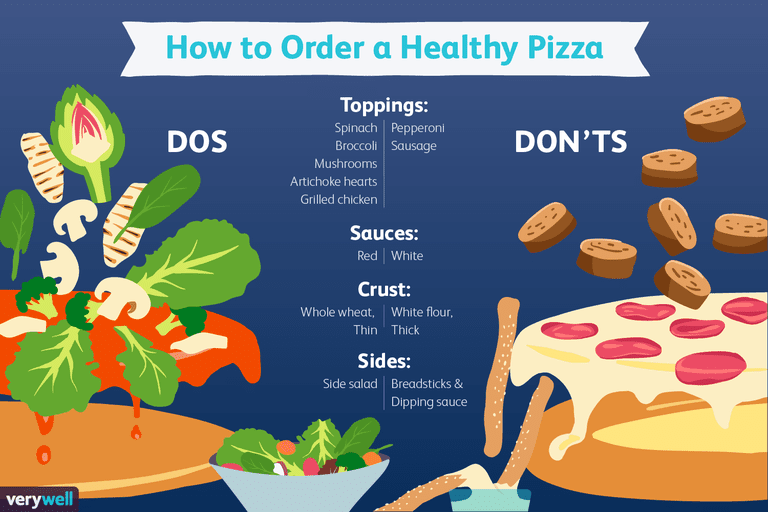 A few simple tips can help you boost pizza nutrition to keep your healthy eating program on track. Pizza calories and nutrition can vary substantially based on the toppings, the cooking method, the crust and the size of the pizza slice. A small slice of cheese pizza (indicated on the label) provides only 168 calories. But a slice of cheese pizza from many popular pizza chains is much larger (100 grams or more) and is more likely to provide 250 calories or more. A single 10-ounce slice of Costco pepperoni pizza provides over 600 calories, according to several sources. So what's the easiest way to cut calories in a slice of pizza? Simply asking for half cheese will save you around 50 calories and will reduce your saturated fat intake by about a third. You will probably be pleasantly surprised at how much cheese is still left on your pizza after cutting it by half. If you don't want to cut your cheese by half, you can request part-skim cheese instead of whole-fat cheese. Some pizzerias may even be able to substitute Feta instead of regular cheese. Feta is lower in calories, providing about 50 calories per 1/8 cup serving. For the lowest calorie pizza choices, go cheese-free. Order no cheese on your pizza and then dust each slice lightly with grated Parmesan. Sprinkle red pepper flakes on top to add extra zip if you need it. Pizza that is loaded with meat will not only add calories, but it will increase your intake of saturated fat. For this reason, a pizza loaded with processed meats will the worst pizza for your diet. Let's look at how it increases your pizza calories per slice. For the sake of counting calories, assume that each type of meat that you add to your pizza adds about 40 calories per slice. Of course, that number can vary if your pizza chef is heavy handed and adds a lot of sausage or pepperoni. The number can also vary according to the size of your serving. But if exact nutrition information isn't readily available, it's a good estimate. When you calculate the calories in pepperoni pizza, add 130 calories per ounce of meat added. A typical slice of sausage or pepperoni pizza contains between 200 and 250 calories. For a lower calorie alternative, try chorizo—a spicy Mexican smoked sausage variety—which will save about 20 calories per serving while still providing that smoky hot flavor you crave. Or try Canadian bacon for about 80 calories per ounce. Other alternatives include extra lean ground beef or ground turkey breast. And grilled or roasted chicken is another delicious and diet-friendly topping. If you can't order a leaner meat, you can still cut calories from your pepperoni or sausage pizza. Use an absorbent paper towel or several paper napkins to soak up some of the grease from your slice. You can save 15 to 25 calories per serving. Your lowest calorie pizza choice will almost always be a vegetarian pizza. Most veggie pizza provide 200 calories or less. Vegetables provide flavor with very few calories. Choosing veggie toppings like green peppers, tomatoes, and onions will also add diet-friendly fiber and antioxidants while cutting calories. You might even try spinach or even broccoli for a change. After a while, you may find in time you prefer veggies on your pizza instead of meat toppings. Order thin crust pizza to save calories. For instance, deep dish crust contains about 100 calories more per slice than thin crust. Replace regular crust with a whole-wheat crust to get nearly 20 percent of your fiber needs for the day. Avoid dipping sauce like garlic butter or ranch to save hundreds of calories (especially if you double or triple dip your slices). They're just not worth the extra calories. Skip the breadsticks when you order pizza. Indulging in just one breadstick will add about 200 calories to your meal. White pizza can be higher in calories than traditional pizza because pesto or olive oil is used in place of low-calorie tomato sauce. With just one vegetable topping, a typical slice of white pizza provides close to 300 calories. Visit a locally owned pizzeria. A small restaurant may offer a greater variety of healthy toppings than chain restaurants. Options might include grilled shrimp, green peas, asparagus spears, artichoke hearts, black beans, corn, spicy fajita chicken, lemon grilled chicken or fresh minced garlic. Lastly, if you like to cook, consider making pizza at home. Cut some of that fat and calories from pizza to make a more diet friendly meal.​ To make a healthier pizza, ​use a non-stick pizza pan. You can cut up to 100 calories per slice if you skip the oil when you bake. A standard non-stick pan works well, but there are also brands like T-fal that make perforated round copper color pans just for pizza. The perforation helps air circulate so the crust heats evenly, and the surface reduces the need for oil and makes cleanup easier. Load up on healthy toppings like colorful vegetables and lean meat, then enjoy your pizza pie with less guilt. USDA National Nutrient Database for Standard Reference. Basic Report: 21299, Fast Food, Pizza Chain, 14" pizza, cheese topping, regular crust. 2017.